In my last post I talked about projects co-created during the Fall Semester by students in my Museum Practices graduate seminar at the University of Memphis. This week I report on implementing those project in Peru. 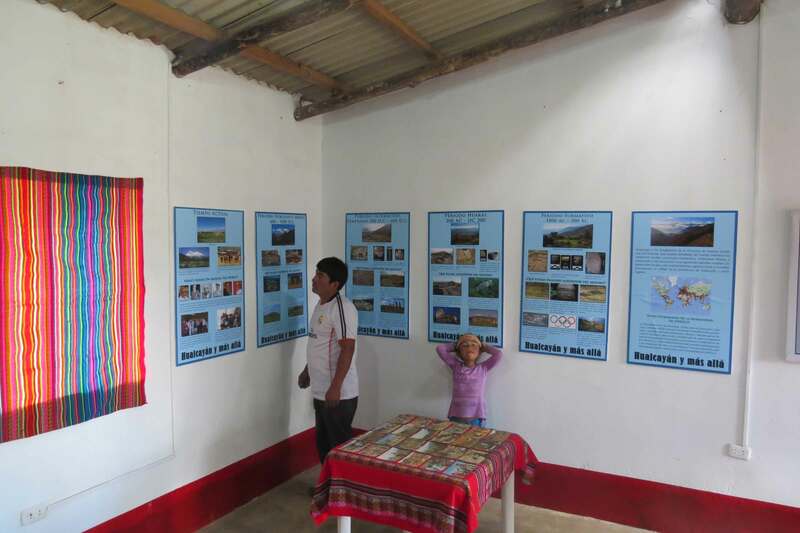 Timeline Banners installed in Museo de Hualcayán. begin on July 1, of 2015. In delivering the documents, we suggested that the community discuss the content between now and the July 1 timeframe start date to refine and amend the Plan’s content. In this way, the Strategic Plan’s co-creation extends beyond the content but to include the implementation – an important step for the community’s ultimate role in administering a sustainable cultural heritage program in Hualcayán. Museum Timeline Banners – We mounted and installed the six banners requested by Hualcayán teachers that present a linked local, regional, and international timeline. U of M students Christian Roesler and Mariah Selitsch researched, designed, and printed the banners. The products are of a professional quality, address specific topics raised by the Hualcayán teachers – all for under $75.00 US, thanks to the Museum Practices students. 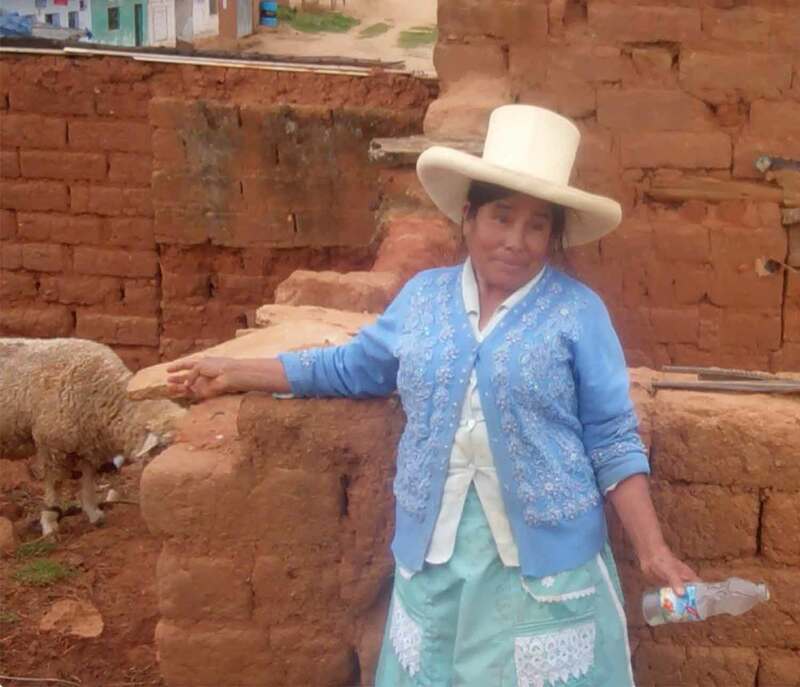 Delia, a Quechua woman interviewed by students for the oral history project. In January, Elizabeth and I also met with the Women of Hualcayán artisans who are creating woven, sewn, and embroidered crafts that are currently sold at two locations in the United States. The project was launched in the summer of 2014. Alicia Anderson, one of the Museum Practices students, thoroughly researched fair-trade and other similar small start-up projects to determine best practices toward a sustainable operation for the women artisans. In January, we were able to discuss a range of options with the women on how they wished to move forward. The conversation assured that community expectations aligned with the actual possibilities for the project. An important aspect of our trip to Hualcayán in January was for two archaeologists to make the trek to the rural community, located a 12-hour commute from Lima, for purposes other than those directly related to their archaeological research. The sole purpose of our January visit was to respond to the community’s expressed needs. We went to Hualcayán in response to John Cotton Dana’s (1917:38) prophetic co-creative call nearly one century ago to “Learn what aid the community needs: fit the museum to those needs.” I suggest the same call is applicable for outreach work in applied archaeology as well.